It was March of her senior year at Columbia University, and Rachel Casto wasn’t feeling like herself. She was overwhelmed with school, and her current medicine and therapy weren’t working anymore. Casto — who is diagnosed with bipolar depression — visited her psychiatrist and relayed how she felt, worried she might harm herself. He advised inpatient treatment, where patients stay at the hospital for overnight care. 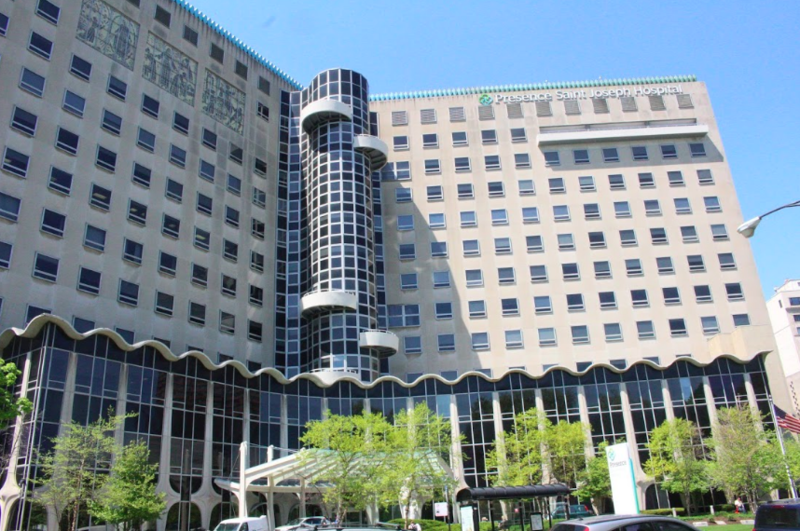 Casto packed a bag — basics like clean clothes — and admitted herself to Presence Saint Joseph Hospital at 2900 N. Lake Shore Drive. Once at the ER, Casto was reassured she was safe, but was first asked if she had insurance, and if so, what plan. Like most private hospitals, Presence Saint Joseph requires insurance for care. “It was pretty clear that if I didn’t have insurance they weren’t going to take me, at least that’s the vibe I got,” said Casto. After waiting seven hours in the emergency room, Casto was admitted to the behavioral health unit of the general hospital. The remaining four days of her stay included group therapy in the morning, individual consultations in the afternoon and a lot more waiting. According to Casto, the time allowed her to reorganize her thoughts and reprioritize her needs, including changing her medication. For the five-night stay, Casto was billed roughly $12,000. With insurance, the out-of-pocket cost came to $1,400. Casto is one of 1.5 million Illinois residents living with a mental illness. Yet, unlike Casto, 53.3 percent of Illinois residents do not receive proper treatment, according to a 2018 Mental Health America report. 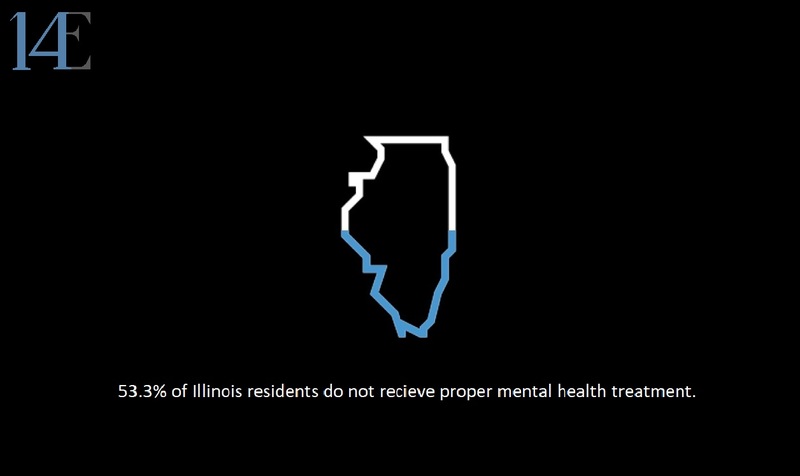 The same study reports 16.5 percent of Illinois residents living with a mental illness are uninsured, and 15.4 percent of Illinois residents could not receive care due to cost. While Chicago has many behavioral health-specific and general hospitals, such as Presence Saint Joseph, the city has few public hospitals. Public hospitals are open to all clients, insured or uninsured. The lack of access, along with pricey inpatient costs and poor Medicaid reimbursements for caretakers, disproportionately affects low-income and uninsured patients. “If you are uninsured and you are in crisis, you can go to your local ER, but from there they will transfer you to a state hospital,” said Kasey Franco, a representative for the National Alliance for Mental Illness (NAMI) Chicago branch. NAMI Chicago offers education, support and informational programs to individuals, communities and workspaces and has helped with over 750 referrals, according to Franco. In 2016, Illinois also reported 1,200 public psychiatric beds, a 229-bed decrease since 2010. Illinois fails to meet the federal minimum of 50 beds per 100,000 residents, reporting instead roughly nine beds per 100,000 people. According to Treatment Advocacy Center, every state fails to meet the minimum standard — Illinois ranks 36th in beds per capita. “When big state hospitals started closing down, people didn’t have anywhere to go,” said Ashley Williams, a representative from NAMI Chicago. In 2014, Illinois reported over $1.1 billion in hospitalization costs for serious mental illnesses, such as bipolar disorder, major depressive episodes and schizophrenia, according to the Health Care Utilization Project. The increase in hospitalization costs mirrors the increase in emergency room visits for mental health issues, which increased 42 percent between 2014 and 2017. The Illinois Department of Human Services Division of Mental Health (DHS DMH) currently operates two state hospitals located in Cook County — Chicago Read Mental Health Center in Chicago’s Dunning neighborhood and Madden Mental Health Center in suburban Hines. Illinois DHS DMH reports only six state-operated hospitals to cover 102 counties, with some hospitals covering more than 50 counties. Illinois’ 2018 budget allocates roughly $181 million of the $92 billion budget to be spend towards mental health care. Of the $181 million for DHS DMH, $29 million is appropriated to Chicago-Read and $32 million for Madden. Illinois’ budget crisis has resulted in the closure of many mental health facilities, including two state hospitals. The city of Chicago also provides public mental health centers, yet these facilities only accommodate outpatient or walk-in consultations. If inpatient care is needed, these patients are sent to either private hospitals if insured or public state hospitals if uninsured. Patients are responsible for their own commute. In 2012, Mayor Rahm Emanuel consolidated the city’s 12 mental health clinics into six in an effort to focus on “serving the uninsured and strengthening the city-wide mental health system to better address the needs of all who depend on mental health services,” according to a press release from the Chicago Reader. Instead, the closures displaced mostly African-American and Latinx patients, with part of the estimated savings allocated to private mental health providers. Most of these private providers do not serve uninsured or Medicaid patients. “We’ve gotten more calls from people in panic because they don’t know where to go anymore,” said Ashley Williams, referring to the closures. According to Williams, the NAMI Chicago branch is working to extend its services to South and West Side communities through partnerships with local community organizations. Those who qualify for Medicaid are also eligible for HealthChoice Illinois, a health insurance program that provides recipients with private health care services such as local primary care professionals, hospitals and community services. In 2017, the program was cut in half, with Gov. Bruce Rauner reducing the program’s 12 insurers to its current six. While traditionally the state administers Medicaid benefits, Medicaid managed care is administered through private insurers. Private insurers are then reimbursed by the state. For managed care, Illinois has a reimbursement lower than the U.S. average. The Medicare-to-Medicaid fee, according to the Kaiser Family Foundation, was .61, below the national average of .72 in 2016. The Medicare-to-Medicaid fee index is a computed ratio of the Medicaid fee for each service in each state to the Medicare fee for the same services. As a result, private care providers are less interested in taking Medicaid clients because they are reimbursed less and the time frame in which they receive these reimbursements is undetermined, leading to longer wait lists for managed care and less people being treated. NAMI offers comprehensive fact sheets and infographics detailing mental health conditions, support services and how and where to find treatment. For referrals and non-emergency advice, contact the NAMI hotline at 800-950-NAMI (6264). For an emergency, contact the National Suicide Prevention 800-273-TALK (8255) or text NAMI to 741-741 to talk with a trained crisis counselor at the NAMI Crisis Line.